Take it from a girl who practically has her flat iron attached to her head — straightening one’s hair religiously can be a real chore. The arm-aching monotony, the inevitable burn accidents, the risk of burning one’s home down by inadvertently leaving the darn thing on all day… even the most agreeable hair can become a pain to straighten when you’re addicted to doing it almost every day. Yes, I said it — I am addicted to flat-ironing my hair. And while I certainly have no desire to “recover” from this addiction, I do like to keep the deed as painless as possible, and the first step is finding oneself the perfect flat iron. And while looks may take a back seat to function, speed, and precision, I have to say I’ve been digging the influx of festive printed flat irons that skyrocket the tool about a dozen or so notches up the fun scale. 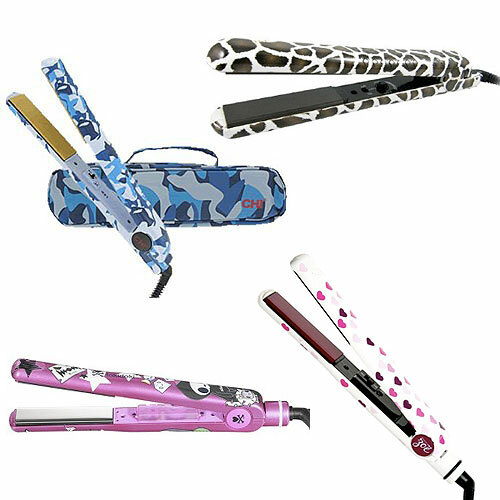 Animal prints, bold colors, hearts, and even camo — just because straightening your hair is a tiresome duty it doesn’t mean your iron has to look like a total snooze! Pictured above: CHI Blue Camo Hair Straightener, Cortex Platinum Flat Iron in Giraffe Print, Zoe Hearts Flat Iron, and Tokidoki Pink Lametta Flat Iron.